In my research of early modern chemistry and medicine, I am currently focussing on the use of metals, particularly quicksilver. But other metals were also used widely, and the use of gold and silver is quite fascinating, in particular because it never disappeared entirely. In the late seventeenth century, silver was used to create aqua fortis or strong water, a kind of nitric acid. This was used to treat skin conditions, and to dissolve gold and make dyes. Silver was also used in medication that was supposed to strengthen the heart, but in 1747, Wouter van Lis refuted this: in his pharmaceutical handbook, he wrote that it is useless to add silver or gold to these drugs, as our body heat is incapable of solving them. Van Lis had a point indeed: pure metallic silver and gold are not really toxic for the human body, as they are relatively resistant to corrosion by bodily processes. That is why eating small amounts of gold and silver leaf is harmless: European food additives E174 and E175 are simply silver and gold. This decorative use of precious metals was also familiar to Van Lis and his contemporaries: he noted that ‘…sometimes medication, like pills, is covered in silver or gold leave, to make it more pleasant to the eye.’ This covering was done in so-called pill silverers: spherical wooden containers on a small foot, into which silver or gold leave was put, moistened pills were added, and gentle swirling produced nicely silver or gold plated pills. Pill silverer, probably nineteenth century. Bisschop, Jan. Pharmacia Galenica & chymica, dat is Apotheker ende alchymiste ofte distilleer-konste : begrĳpende de beginselen ende fondamenten der selver. Verdeylt in acht boecken, tot onderwĳsinge der apothekers / Door een liefhebber derselver konste Nieu licht der apotekers en distilleerkonst. Antwerpen: Reynier Sleghers, 1667. p.361-2 http://books.google.nl/books?id=MFRAAAAAcAAJ&printsec=frontcover&hl=nl&source=gbs_atb#v=onepage&q&f=false. Recently, I wrote a blog about the use of human remains in early modern medicine. Humans were indeed not the only living beings that medical men thought to be useful in remedies. 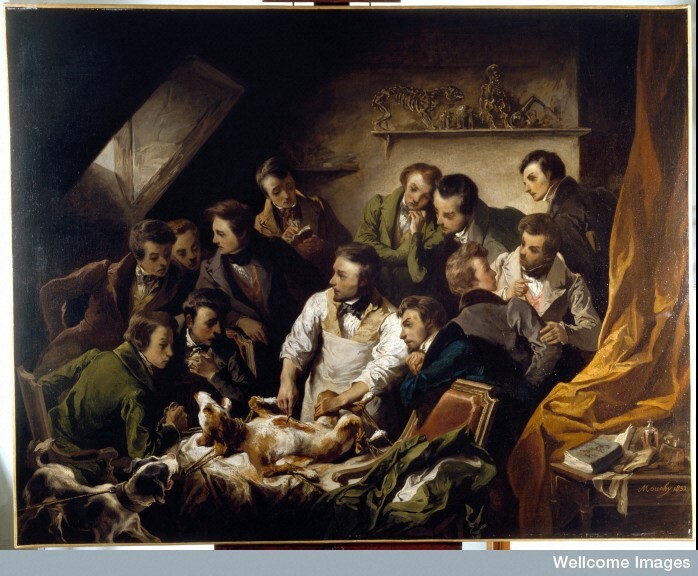 When I tried to gain a better understanding of a preparation of a dog with a cleft palate in the eighteenth-century Leiden University anatomical collections, I found an elaborate contemporary piece on the use of dogs in medicine. It had been written by Martinus Houttuyn (1720-1798), a Dutch natural philosopher who used Linneaus’ categorization of plants and animals to write a natural history in Dutch. His work appeared in multiple volumes in the second half of the eighteenth century. Houttuyn tried to list all the uses of dogs, from hunting, guarding and pulling carts to dinner and medicine. Although he dismissed the eating of dogs as only customary in other parts of the world, dogs could were very useful in medicine. ‘Young Dog Balm’, made out of young dogs boiled in olive oil with herbs and purified dog fat were used as chest relief balms. Small living dogs could be used as a kind of hot-water bag to treat colic pains, and having a dog lick a wound was thought to speed the healing process. The licking of a dog was also a tried cure for gout: having a dog lick the legs of a gout sufferer was likely to kill the dog, but it cured the patient. Similarly (and probably less messy for the client), socks of dog leather could be used to relieve bouts of gout, and gloves of dog skin were beneficial for rheumatic hands. Human skin was would have been even better than dog skin, but as this was scarce and expensive, dog skin was a good alternative. Wellcome Library, London. A physiological demonstration with vivisection of a dog. Oil painting by Emile-Edouard Mouchy, 1832. These examples of how dogs were used in medicine and medical research only two centuries ago demonstrate how culturally defined our relationship with certain kinds of animals is, and that it can change relatively quickly: with the rise of the popularity of the lap dog and the development of bacteriology and a chemical pharmaceutical industry in the nineteenth century, an anti-vivisectionist movement arose, and remedy contents like boiled dogs were not as generally accepted anymore. However, we should not forget that dogs are still important in medical research aimed at developing cures for humans. Houttuyn, M. (1761). Natuurlyke historie of uitvoerige beschryving der dieren, planten en mineraalen, volgens het samenstel van den heer Linnæus. Met naauwkeurige afbeeldingen / Martinus Houttuyn , Eerste deels, tweede stuk. Vervolg der zoogende dieren. Amsterdam, F. Houttuyn: 65-69. Jütte, R. (2003). Die Haut als Heilmittel. Verborgen im Buch – Verborgen im Körper: Haut zwischen 1500 und 1800. U. Zeuch, Wolfenbüttel: 161-166. On the rise of anti-vivisectionism in the late nineteenth-century Netherlands, see Kluveld, A. (2000). Reis door de hel der onschuldigen: de expressieve politiek van de Nederlandse anti-vivisectionisten, 1890-1940. Amsterdam, Amsterdam University Press., chapter 2.